A Joshua Tree stands tall in front of Kessler Peak within the Mojave National Preserve. After leaving Death Valley on Friday afternoon we headed south to the end (the beginning for us) of the Mojave Road, which starts just outside of the Mojave National Preserve near Camp Cady, which isn’t too far off of I-15 east of Barstow. Driving down the sandy Mojave River bed at the beginning of our journey towards the Mojave National Preserve with the Cady Mountains in the distance. 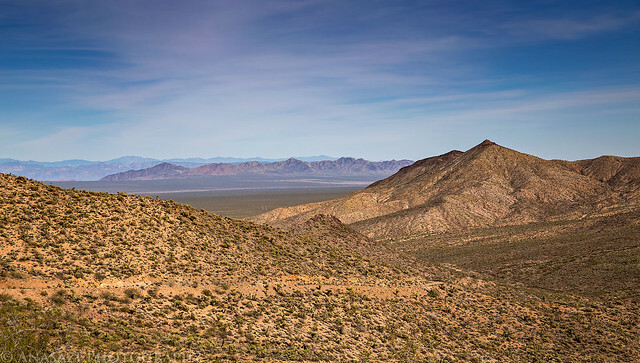 For those not familiar, the Mojave Road is an ancient trade route that spans the Mojave Desert and was used by the Mojave Indians to connect their villages situated along the Colorado River with the California Coast. The route was later used in historic times by American pioneers on their way to California. 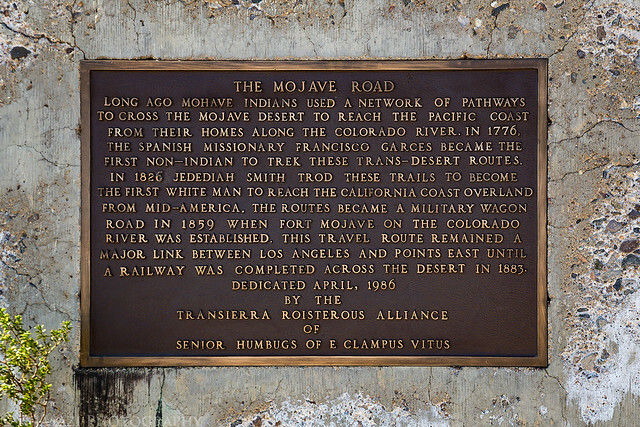 The Mojave Road was utilized as a main wagon trail for only a relatively short time as it was only used for about two decades after the Civil War. That’s when the railroads came in and created an easier route to the south. 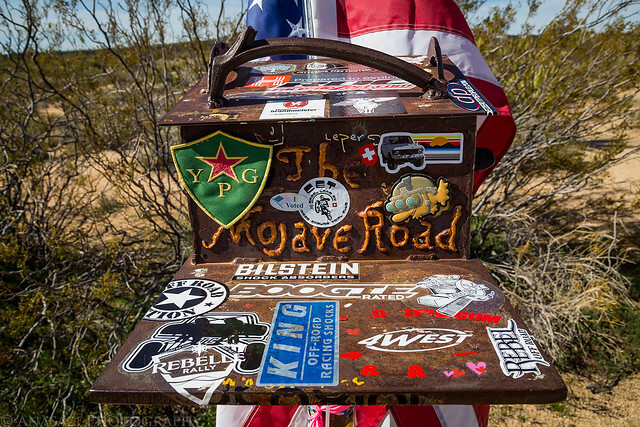 During this routes use, the Mojave Road was plagued by hostile Indians, lack of water, long stretches of sand, and rough hill climbs. For caravans of travelers and a handful of soldiers, it was a proving ground that brought out the best and the worst of them. 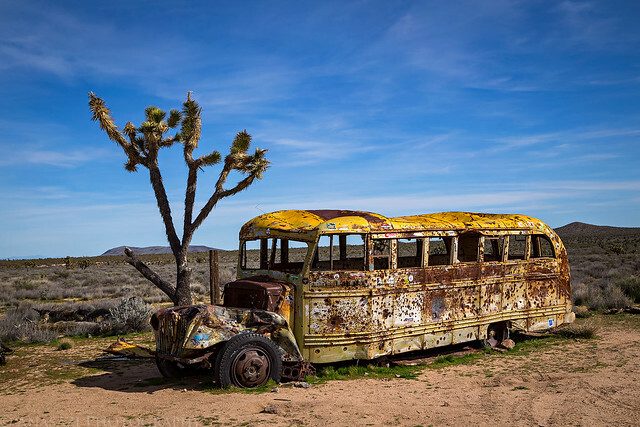 I had planned and hoped to drive the entire Mojave Road this trip, but again, thanks to the recent rains, that would prove to be impossible. By the end of the weekend we would end up driving most of the road in different segments, but not the entire route. That just means I will have to plan another trip here in the future! As sunset was approaching, we still needed to find somewhere to camp for the night. 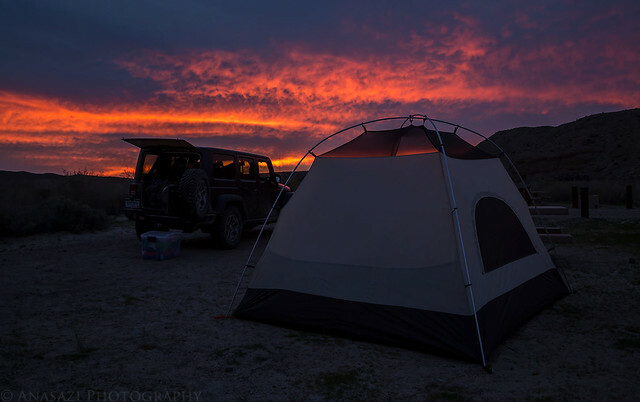 Lucky for us, we happened to drive by the Afton Canyon Campground at this time and it looked like a nice enough place to spend the night, so we did! Even though the mosquitoes seemed to be out in full force as we were setting up camp, there was a pretty amazing sunset that helped make up for it. 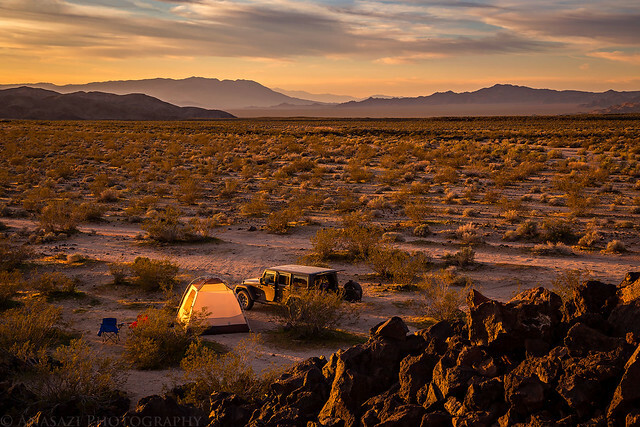 After a good night of sleep we woke up early on Saturday morning, packed up camp, and continue our drive along the Mojave Road. Unfortunately, shortly after leaving camp we came across a few deep water crossings in Afton Canyon. I was able to drive though the first one just fine, but the second crossing was just too deep for my Jeep. We had no other choice but to turn back and find an alternate way around. We backtracked to I-15 which we took to the Baker exit and entered the Mojave National Preserve from there on a paved road. We would later learn that the section of the Mojave Road that crosses Soda Lake, a normally dry lake bed, was also closed because the lake actually had water in it. 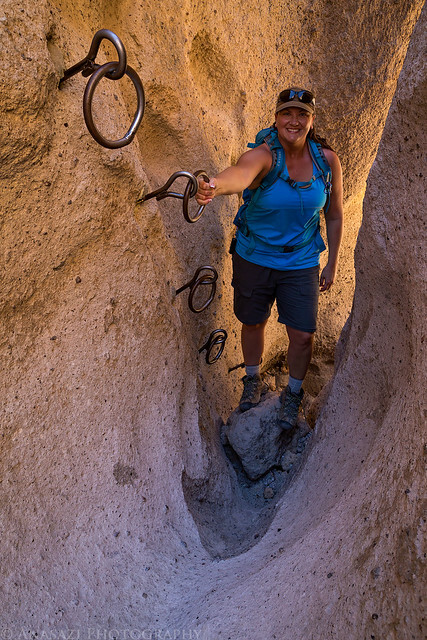 So even if we had made it through the water crossings in Afton Canyon, we would have had to bypass much of this section anyway. 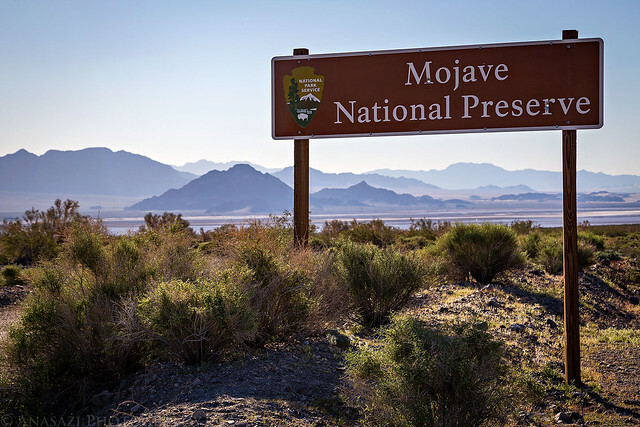 Welcome to the Mojave National Preserve. This shot was taken from Zzyzx Road with Soda Lake and the Bristol Mountains in the background. We topped off the fuel tank in Baker since we had to drive through anyway and then continued into the Mojave National Preserve on the Kelbaker Road. Our first destination in the Preserve was to explore the Counsel Rocks Archaeological Site in search of pictographs and petroglyphs. We quickly found a rock shelter containing many faded red pictographs. A better look at the pictographs. We then spent some time exploring the large boulders scattered at the base of the mesa. We found many petroglyphs and a few more pictographs here. A large boulder with a handle. 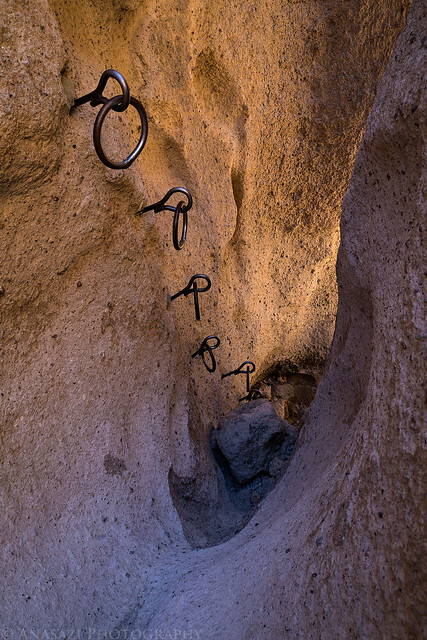 We found these pictographs after climbing into a small shelter underneath a large boulder. This was the best petroglyph panel we found here. After leaving Counsel Rocks we drove over to the the Hole-in-the-Wall Visitor Center so Diane could pick up another magnet. While we were here, we also hiked the popular Rings Loop Trail. I wonder why they call it the Rings Trail? 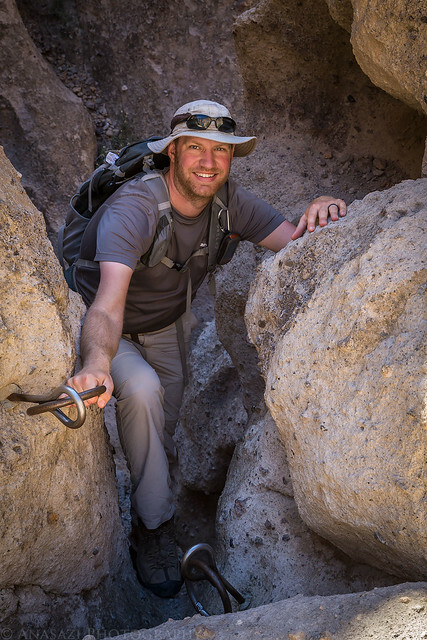 Hiking through a short narrow passage. Diane ready to climb up the rings. Diane grabbed my camera and took this photo of me. Next up we headed back to drive another section of the Mojave Road between the Kelso Cima Road and the Aiken Mine Road. While this stretch was technically easy, it was very bumpy and slower going than I had anticipated. This monument was located at the intersection with the Kelso Cima Road and has a little bit of history about the route. 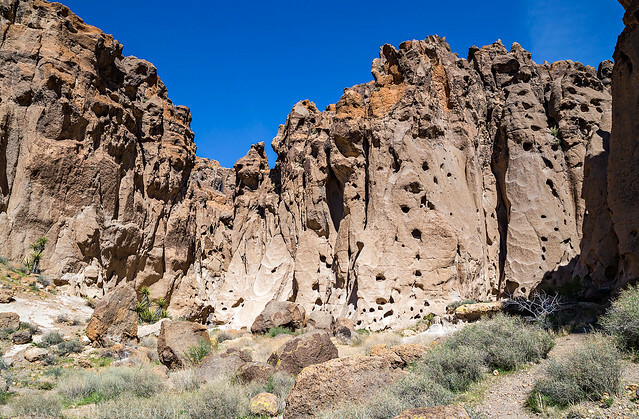 When we reached the Aiken Mine Road it was time to explore the Cinder Cone Lava Beds area and hike to the rock art found along Black Tank Wash. We ended up driving completely around one of the cinder cones and past the old Aiken Mine while trying to reach the trailhead. 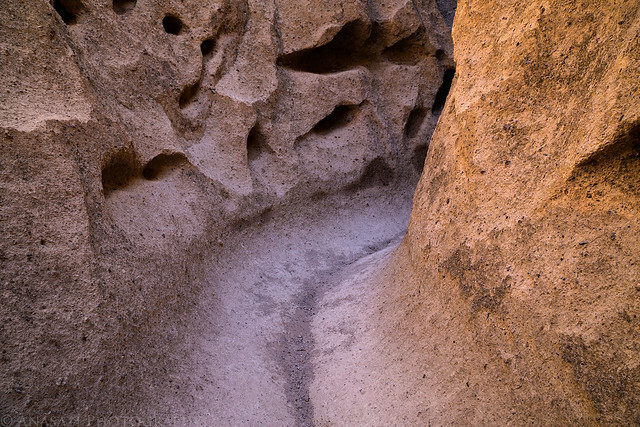 As we hiked along Black Tank Wash, we found many petroglyphs and these pictographs underneath Aiken Arch. 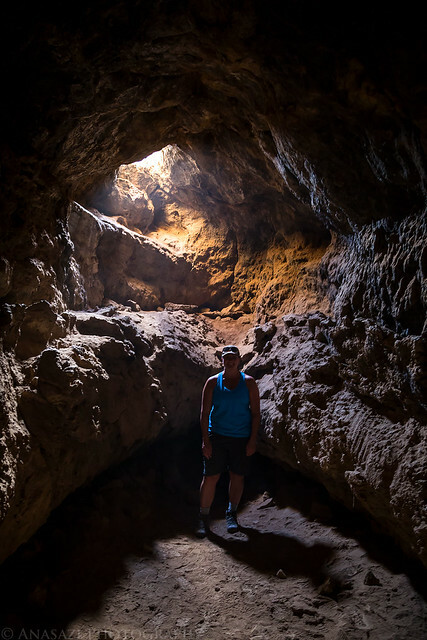 Even though it was starting to get late and we had already had a long day, we stopped to hike down into a lava tube since we drove right past it. It was a short hike and didn’t take us very long. There was a metal staircase installed that allowed access inside. 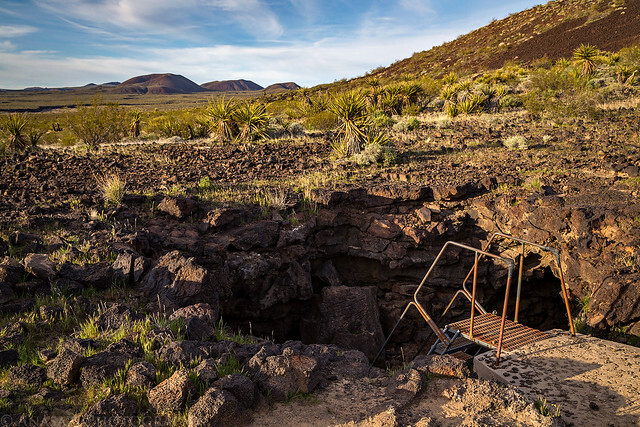 Lava tubes are formed when the surface of a stream of lava cools to form a hard crust, but the lava below the surface stays hot and continues flowing. When this happens, the molten lava, which stays hot because it is insulated by the crust, can flow out from under the crust, leaving behind an empty tube. Diane at the end of the lava tube. We were here way too late in the day to see any light beams. Like I said before, it was getting late and now we really needed to find a campsite quickly! 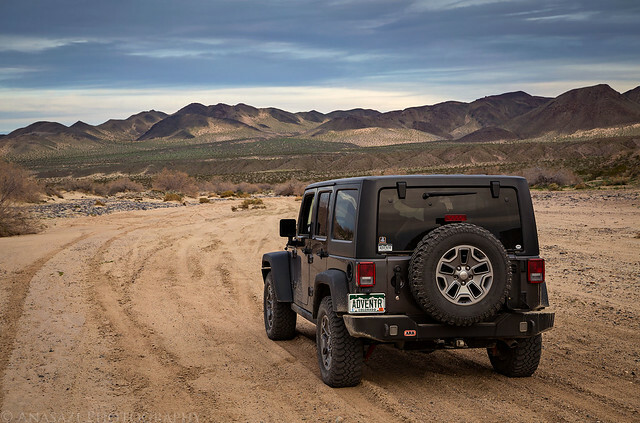 We hopped back on another stretch of the Mojave Road in search of one. As we were driving though Willow Wash we passed a few decent sites, but I thought we could do better so I pushed on. I’m glad I did because we found a really nice site at the edge of the old lava flow along the side road to Indian Springs. 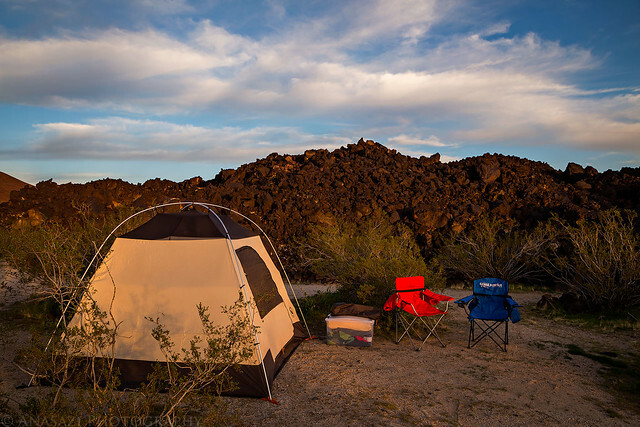 Our nice campsite next to the old lava flow. After quickly setting up camp I climbed up onto the lava rocks to photograph the spectacular sunset! 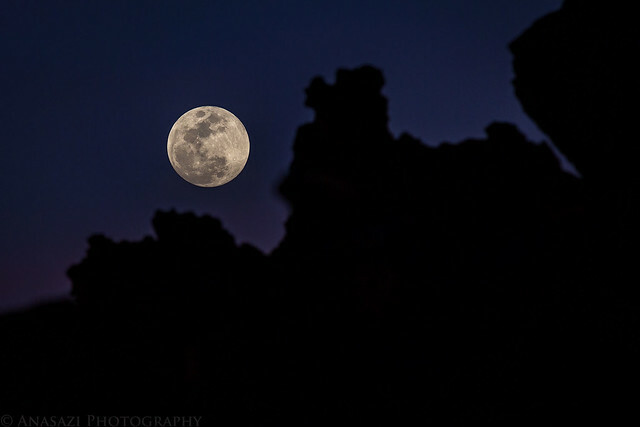 The moon was rising as the sun was setting. The sky was full of great color to end the day. 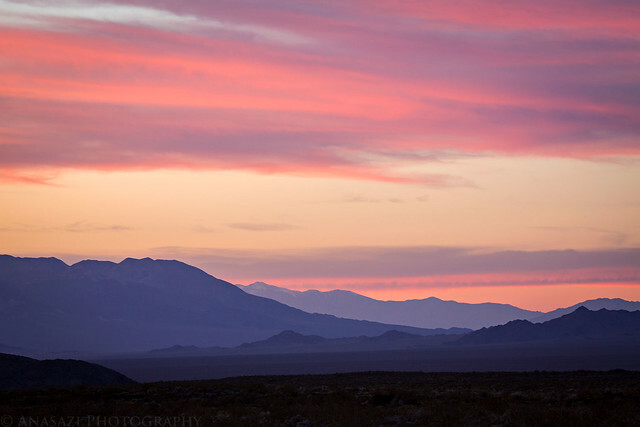 A beautiful Mojave sunset! As usual, we had another long day planned so we were up early, packed up camp and were off to our first destination. This morning we would be hiking out to the petroglyphs in Cow Cove. 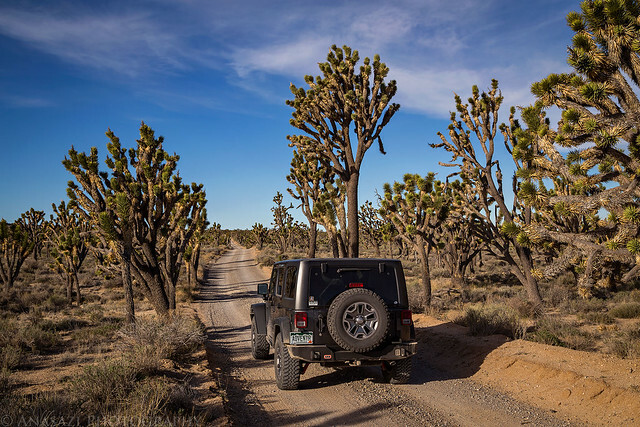 Driving through a Joshua Tree forest on our way to the trailhead. After hiking about a mile and a half across the desert we found the large outcropping of boulders that contained the petroglyphs. They were scattered all over the place. We spent more time here than we had planned and kept finding more. I’m sure we could have spent all day here and kept finding new designs. There were many petroglyphs scattered among the boulders in this section. These were some of my favorite designs from this location. It was nice that a few clouds moved in overhead for the photo. 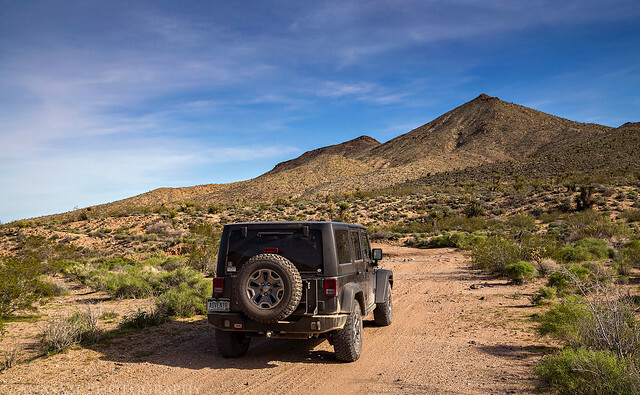 After hiking back to the Jeep it was time to get back onto the Mojave Road. Our plan was to leave the Preserve today and make our way back into Nevada, and I thought that taking the Mojave Road west would be the best way to do that. On the map it didn’t look like it was that far of a distance, but this section of the road turned out to be the roughest yet and it really slowed us down. We started from the Kelso Cima Road and took it all the way to Highway 95 in the Piute Valley in Nevada with a couple stops along the way. One of our first stops was at the Rock House near Rock Spring. This house was constructed by Bert Smith in 1929. Bert came to this area to recover from poison gas exposure suffered during World War I. 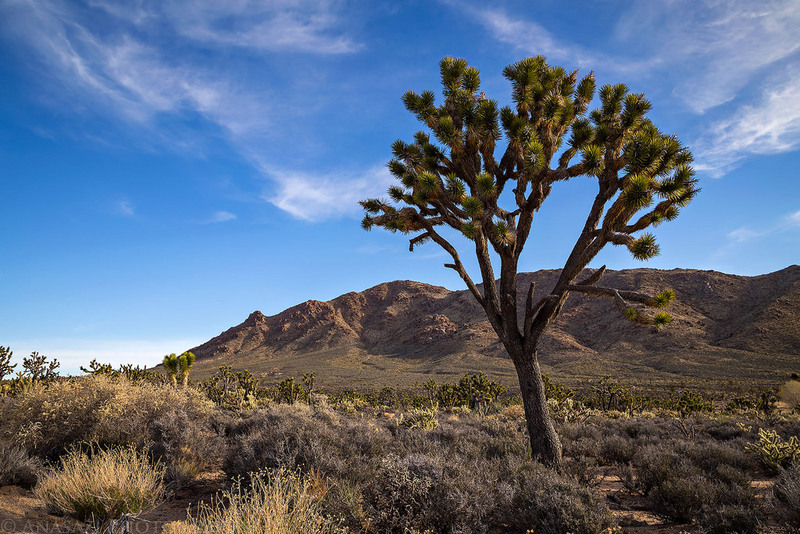 Doctors told him he didn’t have long to live, but the dry desert air proved so beneficial to Smith’s health that he lived here for 25 more years! We visited this old school bus in the Lanfair Valley. Then we started down the old road through the Piute Range into Piute Valley. This would be the roughest section of the road that we would drive all day. It seemed to have taken a beating from the recent rain storms and was washed out in many places. The view down into Piute Valley. You can see the road down cutting across the hillside in the foreground. Driving through the Piute Range. 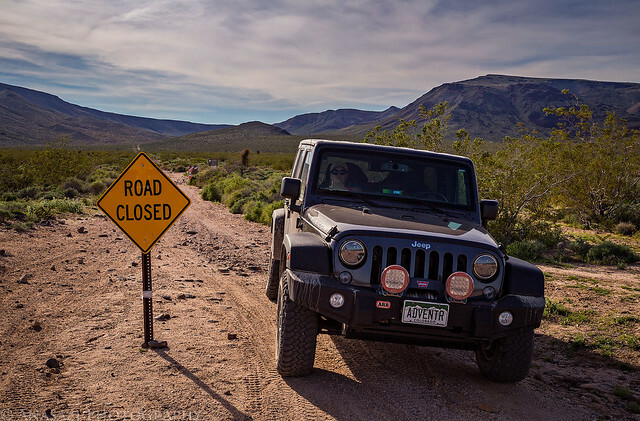 When we reached the intersection at the bottom of the Piute Range we encountered a Road Closed sign right in the middle of the road? We had not seen any sign at the top that stated the road was closed, otherwise we would have turned around and found an alternate route. 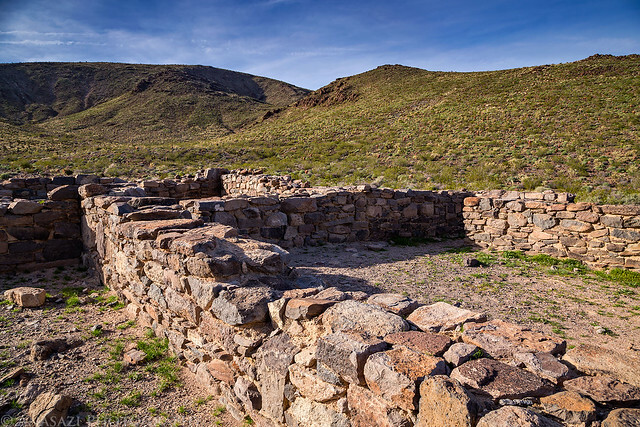 Our last stop of the day was visiting the ruins of Fort Piute located near Piute Springs. 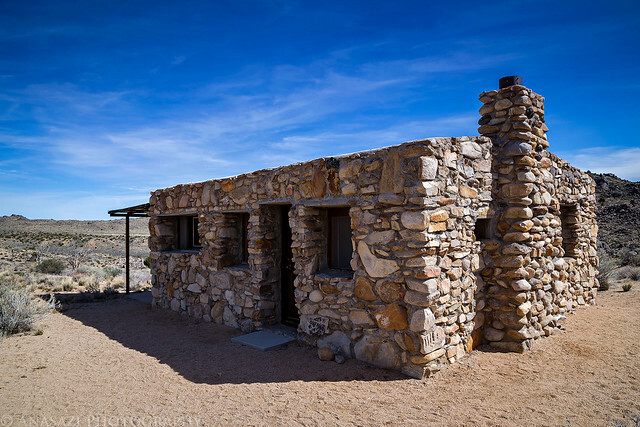 Fort Piute was just one of a string of military outposts built along the Mojave Road. From here we finished following the Mojave Road to Highway 95 in Nevada and we were glad to be back on the pavement again. I didn’t have anything planned for this evening, but it was about time for a shower and a real bed, so we drove into Laughlin and got an inexpensive room for the night at the Colorado Belle Hotel & Casino along the Colorado River. Your photos are amazing. So many great pictographs. What great finds! So enjoyed them.! Thanks for sharing them.